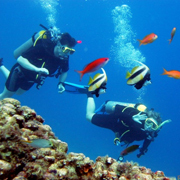 If you are a scuba diving enthusiast, you not want to miss tour chance to venture below the serene surface of the crystal-clear waters off the shores, and go on a Key West Diving trip. Our experienced scuba diving guides will transport you to some of the best dive spots in the region, depending on the conditions for that day. Our savvy dive masters will determine your dive locations by considering the weather, currents, tides, season, and visibility each day to ensure that you enjoy the best possible scuba diving experience while visiting the tropical destination of Key West. Avid scuba divers journey from across the globe to the waters of Key West in order to explore the thriving coral reefs and teeming shipwreck habitats on our morning two tank dive. Because of the infusion of warm water that is carried from the equatorial south to the Florida Keys by the Gulf Stream, coral thrives in area waters. Join us on our afternoon two tank dive and see the stretch of reef off the Keys holds the unique distinction of being the only living coral reef along the Atlantic coastline of North America as well as the single living reef in the continental U.S.A. This bustling environment has a splendid assortment of underwater growth, including sponges, soft corals, and hard corals is the reason diving is a top thing to do in Key West. An amazing variety of marine animals inhabit the reefs and wrecks off Key West, including sea turtles, dolphins, rays, and a stunning amount of prismatic tropical fish. Because of the excellent visibility in the waters, Key West Diving, allows you to see every detail of this wondrous undersea environment. Don't worry if you are not certified our Resort Course Dive is perfect for those looking to get aquainted with diving in key west or if you are ready to dive anywhere in the world check out our Key West Scuba Diving Certifications. Each day we make a dedicated trip out to visit the USNS Gen. Hoyt S. Vandenberg wreck. This is a 520 foot vessel that was once used for missile tracking, but now is the highlight of our morning two tank dives! 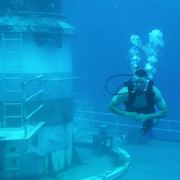 The wreck sets in 150' of water, but we dive to the upper deck areas at around 90 feet deep. Explore the amazing undersea environment off the shore of Key West with our expert diving guides for an afternoon scuba excursion aboard our fully-customized Phoenix dive vessel. Dont miss this opportunity to dive at the only living coral reef on the Atlantic side of North America. If you have never tried scuba diving, but would like to discover the thriving coral gardens in the waters around Key West, then our learn-to-dive Resort Course is ideal for you. 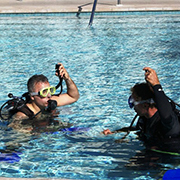 After spending a few hours training in a pool, you'll be prepared for a guided open-water scuba excursion. Make your Key West vacation one to remember! 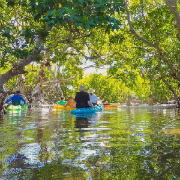 Join us aboard the unforgettable day adventure out to the wildlife refuges of the Florida Keys. The Island Ting adventure takes 20 lucky adventurers on a journey that you will not forget!This journey begins at 10AM, a perfect time of the day to climb aboard a cozy and luxurious sailing catamaran vessel and ride out to the calm clear blue waters of the Gulf of Mexico.